The paved trail will be open to both pedestrians and bicyclists, and take visitors over three new bridges and restored wetlands. They’re the unseen delights off in the distance: rare and threatened plant and tree species from around the world, and grand old Pacific Northwest favorites, beckoning but seldom visited. That will soon change, as a new trail gets built in the Washington Park Arboretum, winding through parts of the 230-acre arboretum little used today because the terrain is wet, muddy and uninviting much of the year, particularly in the areas west of Azalea Way. 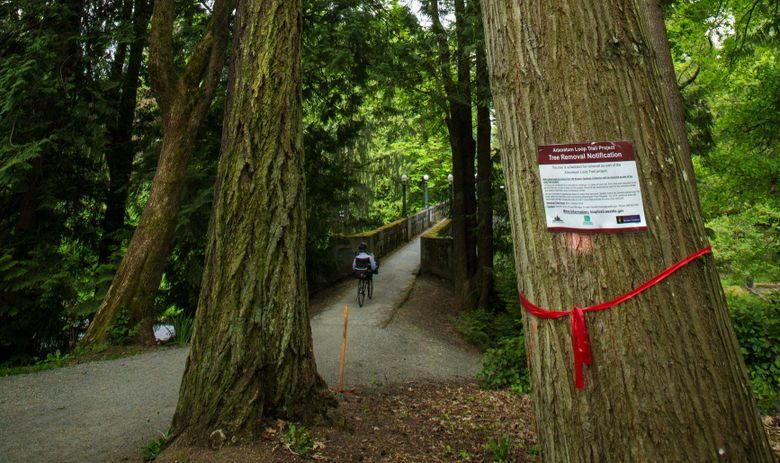 With the new trail it will be much easier to enjoy nationally significant collections year-round of viburnums, ashes, birches, hawthorns, larches and willows, as well as Arboretum Creek, all of which often require mud boots to visit and a penchant for slippery slopes to enjoy. “It’s going to feel much bigger,” Sarah Reichard, director of the UW Botanic Gardens, said of the arboretum. “These areas really don’t get seen now unless you are bushwhacking. There is so much people don’t know is here. “When people use the loop trail, the arboretum is going to be a very different experience.” The arboretum’s new tram also will enable mobility-impaired visitors to enjoy the loop trail in comfort. The trail will be paved and 8 to 10 feet wide, and add 1.2 miles of new pathway to create a multiuse loop totaling 2.5 miles, including connecting existing trails. The $7.8 million trail is being paid for out of WSDOT mitigation funds from its 520 bridge construction project. The money is paying not only for construction, but also to move and replant some trees in the path of the trail and propagate others for replanting. When complete, the trail will be open to both pedestrians and bicyclists, and take visitors over three new bridges and restored wetlands, with newly opened views of Arboretum Creek. The all-weather paved surface will be inviting to wheelchair users, strollers and cyclists but replete with curves and hills intended to slow speeds. The trail was routed around most rare, very large, or unusual trees. Others are being hand dug and moved or replanted from cuttings or seeds taken as long as two years ago in preparation for the project. On a recent tour, Reichard pointed out trees marked for cutting — more than 130 — to make room for the trail. She stressed that many more trees are being planted as part of the project than are felled, at a ratio of about seven trees planted for each one cut. Ray Larson, curator of living collections for the UW Botanic Gardens, said plans on paper continue to be redrawn as the trail is fitted to the living reality on the ground. The goal is to attain the best trail with the least impact to the existing collection, Larson said. Seattle Parks and Recreation owns the land at the arboretum and manages the arboretum cooperatively with the UW Botanic Gardens. Garrett Farrell, senior capital projects coordinator for parks, has his name and phone number on every tree marked for removal in the project. He said complaints so far have been light. One reason may be the project has long been in the works: The loop trail is part of the arboretum’s 20-year master plan, adopted in 2001 after much public participation. Construction began March 7 and will continue through December 2017, Farrell said. Sections of the new trail will open as soon as they are completed. Planting will be phased with the seasons. The arboretum will remain open during construction, with some parts of existing trails temporarily rerouted or closed. During construction, visitors will in some places encounter flagging, signs explaining the project, and the telltale mounds and pits of trees being root-pruned, dug and moved, as well as stumps and tree cutting. 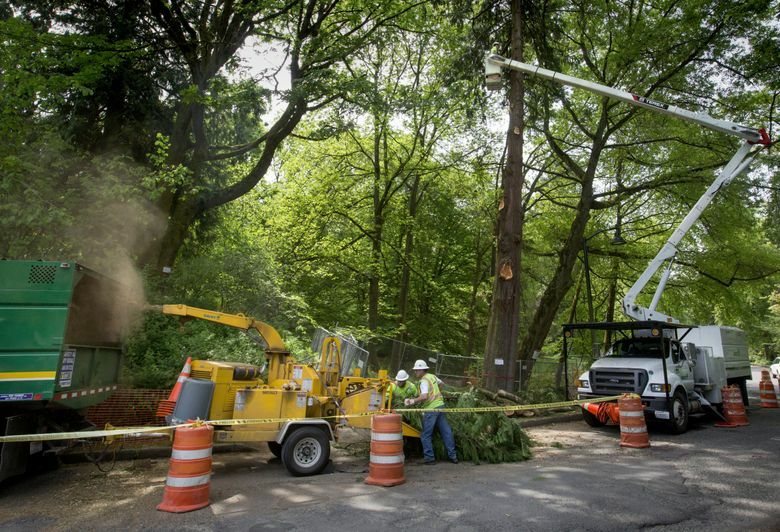 A must-see of Seattle’s public gardens, Azalea Way, is untouched by the construction project. Construction isn’t keeping people away; the arboretum has enjoyed record visitation since trail work began.